The first French Air Force squadron to operate the Dassault Rafale omnirole fighter attained full operational capability here on June 27, during a ceremony attended by French Prime Minister Dominique de Villepin, Defence Minister Michèle Alliot-Marie and other senior government officials. This largely symbolic event took place the day after two of the squadronâ€™s deployed aircraft effectively stood up for their first operational air defence mission at Mont de Marsan air base, in southern France. The unit based here, n° 1/7 â€œProvenceâ€ squadron, previously operated Jaguar fighter-bombers in the ground attack role. It has now taken delivery of ten Rafales, and will receive another ten by the end of the year, when it will attain its full operational strength. A second Rafale squadron, this time tasked with the nuclear strike role, will stand up in 2008 with another 20 aircraft. In all, the French Air Force will receive 234 Rafales, split between Rafale B two-seat and Rafale C single-seat versions, while the French Navy will operate 60 Rafale M single-seaters. To date, 120 Rafales have been ordered for both services, and 34 have been delivered. The Air Force order covers a total of 82 aircraft (44 single-seaters and 38 two-seaters) with an additional 38 Rafale Ms â€“ all single-seaters - for the Navy. Under current plans, production is to continue until 2023. In fact, the French Air Force considers that two Rafales will provide commanders with the same mission capabilities as a formation of four Mirage 2000D attack aircraft escorted by two Mirage 2000-5F air superiority fighters. In this sense, says Dufour, it is a true force multiplier. The â€œProvenceâ€ squadronâ€™s pilots, who spent about two years working up on the Rafale at the operational conversion unit in Mont de Marsan, have logged an average of 120 to 130 flight hours on the aircraft. â€œThe most noticeable difference compared to other aircraft is that Rafale is a flying computer. It manages its own flight parameters, leaving its pilot free to concentrate on the tactical mission,â€ says Capt. Nicolas Lyautey, one of the first pilots of n° 1/7 â€œProvenceâ€ squadron to convert to the Rafale. He previously flew Jaguar fighter-bombers, comparable to Rafale in terms of size and weight but clearly outclassed in terms of capabilities. He went solo on the Rafale after only four flights with an instructor, and says that the aircraft is so simple to operate that pilots can undertake their first operational missions after about 50 flight hours. The Rafaleâ€™s central computer monitors all flight, engine and system parameters as background tasks, and they are only brought up on the cockpitâ€™s three LCD screens or head-up display when a decision or an input is required from the pilot. This avoids information overload, reduces workload and creates an uncluttered environment in which aircrew can concentrate exclusively on flying the mission. â€œUsing the autopilot, auto-throttle and navigation aids, the aircraft can fly a complete high-speed mission at an altitude of 200 feet above sea level without any intervention by its pilot,â€ says Jean-Marc Gasparini, deputy Rafale program manager for Dassault Aviation. Another unique capability, according to Col. François Moussez, the French Air forceâ€™s Rafale program officer is that it can fire missiles at targets detected and designated by its integrated Spectra countermeasures suite, again without any need for active transmissions that can give away its position. Remarkably, Rafale will continue to offer capabilities in advance of its competitors thanks to an upgrade policy adopted by the French defence ministry. This ensures that in-service aircraft are upgraded as new capabilities are cleared, so that the entire fleet is always maintained at the latest available standard. The first Rafales to enter Navy service were configured to the F1 standard, optimised for air-to-air operations. The F2 standard is networked-enabled and adds air-to-ground capabilities, allowing Rafale to fire Scalp cruise missiles, made by MBDA, as well as AASM precision-guided bombs made by Sagem Défense & Securité. Dassault is now working to finalize the improved F3 standard, which will be available from June 2008 and will add additional weapons, including the ASMPA nuclear stand-off missile, the AM-39 Exocet anti-ship missile and the Thales Reco NG reconnaissance pod. All navy and air force aircraft already in service will be retrofitted to F3 standard by uploading a new software package, which will become standard fit for all subsequent production aircraft. Further improvements are planned as part of the programâ€™s â€œR&D feeding policy,â€ although not all have been approved or funded to date. These will ultimately include uprated Snecma M-88 engines each delivering 9 tonnes of thrust (compared to todayâ€™s 7.5 tonnes), a new radar with advanced electronically-scanned antenna replacing the current RBE-2 radar with shaped-beam antenna, a new missile warning receiver, an improved Front Sector Optronics system and, beginning in 2012, the Meteor beyond-visual range missile being developed by a European industry team led by MBDA. If approved, these improvements will become standard beginning with the 120th production aircraft, says DGAâ€™s Dufour. Despite this apparent complexity, Rafale was designed to operate with bare-bones support, and for instance has entirely done away with scheduled maintenance â€“ a premiere for an advanced combat aircraft. Thanks to its permanent auto-testing processing and real-time monitoring airframe fatigue by the aircraftâ€™s own computer, maintenance operations depend on the real condition of individual components. Furthermore, all operational and maintenance paperwork is stored in a single computer database, allowing detailed monitoring of aircraft condition by maintenance crews as well as outside contractors. French officials are also at pains to stress that Rafale, despite its quantum leap in capabilities, remains much more affordable than competing aircraft. DGAâ€™s Dufour says that the total cost of the 294-aircraft program, including development, pre-production, production and integrated logistical support, amounts to 33,273 million euros (inclusive of value-added tax) at 2003 prices. This is an increase of just 4.18 percent, or 1,336 million euros, over the projected cost in 1988, when the original contract was signed. Competing combat aircraft cost at least one-third more, reinforcing Dassaultâ€™s belief that the Rafale will eventually score highly on the export market. The French defense ministry has “clarified” its boss's words and said there is no possibility that France would cancel the Rafale program. Longuet's comments in an interview on the National Assembly's TV station LCP could be misconstrued. One of the journalists asked, “Once we have bought all the aircraft we need, will the production be stopped?” This is when Longuet said: “If Dassault does not sell the aircraft abroad, then, indeed, the production line will be stopped but the aircraft naturally will be maintained.” So, only after French needs have been met. "Wenn Dassault im Ausland keine Rafale verkauft, wird die Produktionslinie eingestellt", betonte Verteidigungsminister Gérard Longuet am Mittwoch im Rundfunksender France-Info. Für die zur Zeit bei den französischen Streitkräften im Einsatz stehenden Maschinen hätte das keine Auswirkungen. Eine Einstellung der Produktion käme zudem frühestens nach der für 2018 vorgesehenen Auslieferung der letzten Maschinen an das französische Militär infrage. Mitte Oktober hatte Longuet noch behauptet, der erste Exportauftrag stehe in den Vereinigten Arabischen Emiraten vor dem Abschluss. Sie wollten ihre 60 Mirage 2000 durch 60 Rafale desselben Herstellers Dassault ersetzen. Bisher waren alle Exportaufträge für die Rafale geplatzt, zuletzt einer für die Schweiz. Wär schade. Ist nicht nur ein schönes sondern angeblich auch weitaus besseres Flugzeug, als das, was sonst am Markt so erhältlich ist. Es ist halt schade, dass immer nur die Zahlungen unter der Hand bei der Politik und nicht die Qualität eines Flugzeuges ausschlaggebend für den Ankauf ist. problem ist halt das ein markt für konventionelle trägerflugzeuge eigentlich nicht existiert. zu diesem zeitpunkt gibt es auf diesem planeten 15 schiffe die CATOBAR oder STOBAR können.nicht weniger als elf davon gehören den usa. frankreich,china,brasilien und russland besitzen jeweils einen träger.indien wird demnächst hinzu kommen,hat sich aber für die mig29k entschieden.ebenso großbritannien, welche die F35B (so sie denn kommt) einsetzten wollen. Zuletzt geändert von wARLOCK am 03. Okt 2012, 02:48, insgesamt 1-mal geändert. Handed over to France's DGA defence procurement agency at Dassault's Merignac assembly site on 2 October, single-seat aircraft C137 will enter French air force service with the Thales RBE2 radar. Delivery of the first RBE2 has been achieved "on time and on budget", Dassault and Thales say in a joint statement. A schedule outlined last year calls for the new array to be ready to enter frontline use in mid-2013, and to equip the latest batch of 60 aircraft on order for the French air force and navy. Le développement du radar RBE2 AESA a été décidé dans le cadre d’un programme d’amélioration des capteurs du Rafale, qui comprend également un détecteur de départ missile amélioré et une optronique secteur frontal de nouvelle génération, deux systèmes équipant aussi le Rafale C137. Die Entwicklung des Radars RBE2 AESA ist im Rahmen eines Programms zur Verbesserung der Sensoren der Rafale beschlossen worden, das einen verbesserten Raketenwarner ebenso umfasst, wie einen frontalen optronischen Sensor neuer Generation, zwei Systeme mit der auch die Rafale C137 ausgerüstet ist. A ce jour, 180 avions de série ont été commandés par la DGA et 111 appareils livrés dans ses 3 versions : 36 monoplaces embarqués « M » pour la marine, 38 biplaces « B » et 37 monoplaces « C » pour l’armée de l’air. Le Rafale a été déployé en Afghanistan et en Libye. Les principaux industriels assurant la réalisation du Rafale sont Dassault Aviation, Thales, Safran et MBDA. Bis heute sind von der DGA 180 Serienflugzeuge bestellt und 111 Geräte in drei Versionen ausgeliefert worden: 36 Einsitzer der Bezeichnung "M" für die Marine, 38 Zweisitzer "B" und 37 Einsitzer "C" für die Armée de 'Air. Die Rafale ist in Afghanistan und in Libyen eingesetzt worden. Die hauptverantwortlichen Industriepartner zur Realisierung der Rafale sind Dassault Aviation, Thales, Safran und MBDA. Après avoir été réceptionné par la direction générale de l’armement (DGA) le 12 septembre 2013, le Rafale biplace immatriculé B 339, premier exemplaire de la 4e tranche de production du programme Rafale est arrivé le 17 septembre sur la base aérienne 118 de Mont-de-Marsan. Les 60 avions de cette tranche de production sont tous équipés en série de capteurs nouvelle génération, à savoir du radar RBE2 AESA à antenne active, du détecteur départ missile de nouvelle génération (DDM NG) et de l’optronique secteur frontal « identification et télémétrie ». France has signed a development and integration contract worth around €1 billion (US $1.4 billion) to upgrade the Dassault Aviation Rafale fighter with arms and systems, including a long-range missile, and make improvements on a targeting pod and active electronic radar, the procurement office said in a Jan. 10 statement. Late last year, Lockheed Martin was still showing a chart to potential industrial partners that depicted all the so-called fourth-generation fighters going out of production well before 2020 and leaving the F-35 with a Western-world monopoly. That script is not playing out as written. In January, France committed to another upgrade of Rafale, and although negotiations with India continue to grind forward at less-than-warp speed, even its Eurofighter rivals concede that Dassault has the inside track in Qatar—as many as 36 aircraft in a first batch and more to follow—and the United Arab Emirates’ requirement remains active, following its expulsion of Eurofighter at the end of 2013. Meteor has had a long development process and has been criticized for its high cost, but the four Eurofighter nations—Germany, Italy, Spain and the U.K.—along with France and Sweden) have now ordered the missile and MBDA has an order backlog in four digits. Rafale’s F3-R standard, under contract since January and due for service entry in 2018, provides for two Meteors on the aft body weapon stations. Technically the aircraft could carry more than that, Dassault says, but so far that is all the French customer has requested. The Meteor development program is through, with MBDA continuing to support Rafale and Typhoon integration. “Pilots are saying that when we take it into service, we’ll have to redo all our fighter tactics,” the MBDA executive says. The company continues to say that against an agile, evading target, Meteor’s no-escape zone—the area within which, if a missile is launched, the target cannot kinematically avoid being hit—is three times larger than that of a conventional single-pulse rocket weapon in a head-on engagement, and five times larger in a tail-chase. The key is the ramjet engine, which is not only more efficient than a rocket but can also be throttled: the burn rate of the boron-based sustainer propellant is determined by pressure, so can be controlled by a valve between the propellant container and the ramjet duct. This process is controlled by Meteor’s guidance system: After the boost phase, the missile reaches a set cruise speed, but then accelerates as the target gets closer. “The goal is to convert all the fuel into speed at target impact, but not before,” Aviation Week is told. Rafale already carries a wider range of weapons than its European rivals. The F3-R program brings on the Thales PDL-NG next-generation laser-designation pod, replacing the current Damocles. With high-definition sensors and better display formats, including a picture-in-picture mode, and in conjunction with new software, the PDL-NG is intended to exploit the full envelope of the laser-guided version of the Sagem Hammer bomb family. PDL-NG also will be able to lase the target automatically when necessary, even after the bomb’s long flight time. The pilot’s ability to select different trajectories (such as vertical impacts) and fuze modes will be improved as well. France has also announced big investments for Rafale. Dassault has already inducted the first of the French Navy Rafale F1-standard aircraft to begin an upgrade to the latest service configuration, F3-04T, which includes the active, electronically scanned array (AESA) version of the RBE2 radar and the DDM-NG missile-warning system. The program goal is to retain all the aircraft in service through rolling upgrades, the company says. The DDM-NG, part of the Thales/MBDA Spectra defensive avionics suite, comprises two imaging infra-red sensors located on either side of the fighter’s fin-tip pod, each with a hemispherical field of view and jointly providing full spherical coverage other than the area blanked by the fighter’s wing. Its ability to detect and track other targets, such as aircraft, is classified, according to Dassault. In January, the French defense ministry awarded Dassault a contract for the next major Rafale upgrade, known as F3-R. It includes more powerful processors and upgrades to the Multi-functional Information Distribution System-Low Volume Terminal datalink and the automatic ground collision avoidance system. For tactical and strategic reconnaissance missions, F3-R will include in-cockpit replay and analysis of imagery from the Thales Areos long-range oblique photography (Lorop) reconnaissance pod. The Rafale pilot or weapon system operator will be able to review imagery without interrupting the pod’s collection process. The upgrade will also see a series of improvements to Spectra. Developed by Thales and MBDA, Spectra is a fully automated system that provides electromagnetic detection, laser and missile warning, jamming and four chaff/flare dispensers. French industry sources say that during operations over Libya in 2011, Rafale literally disappeared from the radar screens of the Libyan air force, performing “soft kills” on enemy radar systems. Bruno Carrara, director of the Rafale program at Thales, says the F3-R upgrade will involve a more advanced electromagnetic detection capability based on new digital wide-band-receiver technologies, improving the suite’s spectrum analysis as well as its instantaneous interception capability. Thales will also update Spectra’s solid-state jamming subsystem, which was one of the first to use electronically steered phased-array antennas. Carrara says for F3R, Spectra will include more powerful antennas, while further increasing the power supply so that more threats can be jammed simultaneously. Like Saab, Thales will use GaN technology because of its power and efficiency. Gibt es eigentlich eine halbwegs akkurate Ahnung was Meteor, Iris-T, Spectra, die verbauten IRST und Praetorian wirklich können? Aber konkrete Leistungsdaten konnte ich freilich nicht finden. In deinem Artikel oben stehen explizite Leistungsannahmen und Gerüchte von und zu SPECTRA und Meteor sowie des Eurofighters, da ist eine Frage nach Fakten statt Gerüchten sicher nicht OT wie ich finde. Denn wenn es heisst dass mit der Meteor die ganzen Taktiken umgestellt werden müssen wenn auch die aktuellen AMRAAM eingesetzt werden, denke ich mir dass die Leistung des MBDA Produktes um Welten besser als die BVR Raketen die jetzt im Dienst sind, sein muss und zwar sicher nicht nur wegen des Antriebsystems..
Im www wirst dazu so wie ich auch nichts finden ausser weitere Gerüchte aus anderssprachigen Foren - ich hätte eher gehofft dass wer etwas Insiderwissen hätte, ich nehme auch pm. Trotzdem wie immer danke für die Recherche. IR search and track systems (IRSTS) have been used for air-to-air engagements for some time. The US Navy F-14 Tomcat has such a system, and the Soviet-designed aircraft MIG 29, SU 27 and SU 35 all used first-generation systems. The function of IRSTS is to perform a function analogous to the airborne radar TWS mode where a large volume of sky is searched and targets encountered within the large search volume are characterised and tracked. The major difference is that, whereas the radar TWS mode is active, IRSTS is purely passive. A state-of-the-art implementation of IRSTS is the passive infrared airborne tracking equipment (PIRATE) developed by the EUROFIRST consortium which will be fitted to the Eurofighter Typhoon. Figure 5.20 shows the PIRATE unit and the installation on Typhoon of the left side of the fuselage. The equipment uses dual-band sensing operating in the 3–5 and 8–11 mm bands. 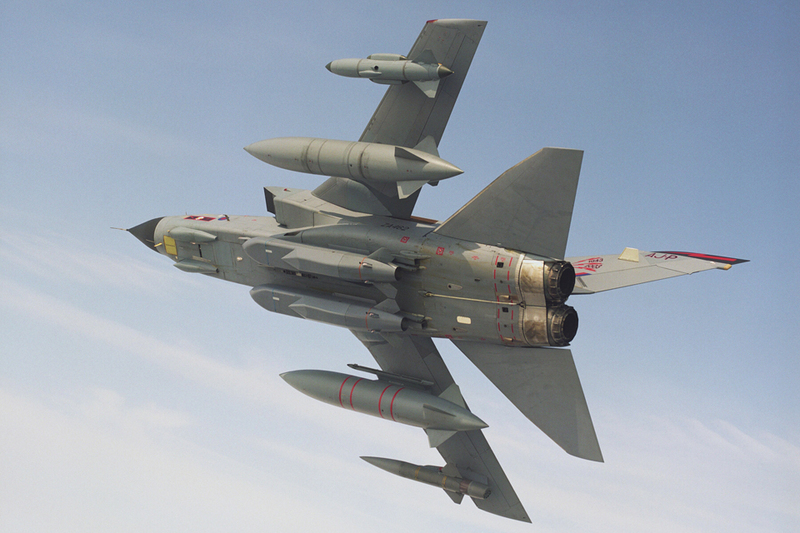 The MWIR sensor offers greater sensitivity against hot targets such as jet engine efflux, while the LWIR sensor is suited to lower temperatures associated with frontal engagements. The unit uses linear 760 x 10 arrays with scan motors driving optics such that large volumes of sky may be rapidly scanned. The field of regard (FOR) is stated to be almost hemispherical in coverage. The detection range is believed to be 40 nm. Single-target track and identification (STTI) for target identification prior to launch, providing a high-resolution image and a back-up to identification friend or foe (IFF). Navigation aid in FLIR mode, allowing low-level penetration. The sensor data may be displayed at 50 Hz rates on the head-down display (HDD), head-up display (HUD) or helmet-mounted display (HMD), as appropriate. An aircraft operating in a hostile military environment needs to be equipped with measures for self-defence. The crew will have been briefed on the threats on their outward and return transits, as well as enemy defences in the area to be attacked or where an engagement is to take place. This will be based on intelligence and will be in accordance with the most up-to-date intelligence compilation. Radar-guided anti-aircraft artillery (AAA or triple-A). SAM from ground sites, vehicles or ships. Appropriate countermeasures include a means of detecting the threat and luring the threat away from the aircraft or causing the missile to detonate prematurely or far enough away from the aircraft so that no damage is sustained. This combination of sensor and countermeasure is often referred to as a defensive aids subsystem or DASS, and often abbreviated to Def-Aids. Figure 6.18 shows an aircraft equipped with a set of threat detectors and countermeasure subsystems. minimise the catastrophic effects of missile or shell fragments by physical separation of critical equipment and wiring to reduce the probability of common mode damage effects. For those weapons employing active sensing there are mechanisms for reducing their effectiveness. On a military aircraft these systems will have the capability of interfacing with the aircraft/mission avionics system by using MIL-STD-1553B data buses or other cost-effective commercial data bus equivalents. A typical radar warning receiver (RWR) is depicted in Figure 6.19. Sensors are located strategically around the peripheries of the aircraft – typically four sensors placed at the wing tips or sometimes at the top of the fin. The objective, as far as is possible, is to provide fullhemisphere horizontal coverage around the aircraft in order that the crew may detect and be alerted to potential RF threats. Each of these sensors may provide up to 90 conical coverage, although in some cases the angular reach may be less than this. A typical antenna used in this application would be a spiral antenna with an angular coverage of 75 but with a gain of 10 dB. This figure should be compared with the 55 dB gain that would be the design point for a LPI radar – a difference of 45 dB or a factor of 32,000. This illustrates in part the disadvantage that the RWR faces while operating against a modern state-of-the-art radar. Other considerations such as the use of sophisticated spread spectrum modulation, radiated power management and advanced signal processing indicate why it is conceivably possible for a sophisticated AESA radar such as the AN/APG-80 as used on the F-22 to operate almost invisibly to some medium-capability RWR equipment. In some cases an audio tone may be derived to provide the pilot or observer with audio cues – typically a tone equivalent to the PRF of the incoming radiation. In early systems the processed outputs were displayed upon a plan position indicator (PPI) in a manner that depicted the angle of arrival according to a clock format with 12 o’clock dead ahead. In the late 1960s/early 1970s, when these systems were operationally deployed for the first time during the Vietnam War, this information would be presented on Standard CRT green phosphor displays. Relative signal strength was shown by the length of the line from the centre of the clock, while the coding of the line into solid, dashed or dotted portrayal was indicative of the modulation type or possibly the band of operation. Early systems such as the air radio installation (ARI) 18228, as employed on the UK F-4K/M Phantom, used a hard-wired implementation to code specific threats and were therefore cumbersome to reprogramme. The advent of digital processors now means that the threat library is coded in Software allowing for rapid updates using a suitable software loading device. On a modern system, particularly since the advent of AMLCD colour displays, display symbology is much more likely to utilise stylised colour-coded symbology which is much more easily recognised by the pilot or radar operator, especially in a stressful combat environment. Typical frequency coverage of a RWR system extends from 2 to 18 GHz and embraces a wide range of electronic threats across the RF spectrum. Modern RWR equipment offers a much more dynamic response to specific threats than was possible with the first-Generation equipment. A missile warning receiver operates on a similar principle, except the missile warning systems (MWS) operate by detecting infrared (IR) or ultraviolet (UV) emissions during and following a missile launch. A typical system is portrayed in Figure 6.20. Although the conical coverage of an IR/UV sensor may be as much as 110, these systems often provide the option of expansion to six rather than four hemispherical sensors – see the F-35 example in Chapter 9. Apart from the sensors, in an overall sense the system works in a very similar fashion to the RWR above. Threat analysis is undertaken within a central signal processor/computing unit, and the results are output to a suitable tactical display. In modern systems this will be a colour tactical display. An example of a missile warning system is shown in Figure 6.21. A laser warning system again uses similar principles, except that the sensors are operating in the laser band. The example shown covers the 0.5–1.8 mm band and addresses the threat posed by the following lasers: doubled NdYAG, ruby, GaAs, NdYAG, Raman shifted NdYAG and exbium glass lasers. Angle of arrival (AoA) is claimed to be within 15 rms and sensor angles are 110. (Figure 6.22). A chaff and flare dispenser is fitted to many aircraft so that appropriate mixes of chaff and flares can be selected and deployed to confuse missile seekers or defence radars. This can be done by providing alternative decoy targets for seekers, or by disguising the aircraft by changing its radar return so that operators cannot set up an aiming solution. Chaff and flares are usually deployed as ‘last ditch’ countermeasures against an incoming missile. Their effective protection zone is to the rear of the aircraft, and they offer no protection against missile engagements in the forward hemisphere. Chaff consists of reflectively coated strips of plastic or metal foil. The strips are designed to a half-wavelength (/2) of a typical homing radar. The chaff can be dispensed in Patterns or blooms to disguise the dispensing aircraft with a view to confusing a radar operator. When released into the turbulent airflow, chaff disperses rapidly (blooms) and for a brief period of time generates a very large, static radar image between the target aircraft and the threat radar, which is probably in tracking mode or CW illumination mode, providing radar guidance for an in-flight missile. If the timing is right, radar or missile lock may be broken. Flares are a countermeasure against IR homing missiles. When deployed, a flare burns with an IR wavelength similar to that of the target aircraft IR signature. It works by initially appearing in the missile seeker head coincident with the target aircraft, but is left behind as the target aircraft performs evasive manoeuvres. Its thermal image is designed to be longer than the target aircraft and it then becomes the preferred IR target for the missile. Timing of deployment is critical. Too soon and the divergence of target aircraft and flare will be detected and the flare ignored, too late and the missile will detonate on the flare and fragments may hit the target anyway. Flare deployment can be used in a ‘saturation’ mode during periods of extremely high risk, where the target aircraft is in very close proximity to a missile launcher and has no time to manoeuvre if missile launch is detected, for example, transport aircraft carrying out lowlevel air drops or landing on captured airfield in hostile territory where MANPAD or Stinger IR missiles may be launched within a few hundred feet of the aircraft. In these circumstances the crew may choose to pre-empt target launch detection by the tactical deployment of multiple flares in the high-risk zone. Figure 6.23 shows an example of a C-130 Hercules deploying multiple flares. The towed decoy is essentially a heat source that is towed behind the target aircraft on a cable. Located in a wing-tip pod, a wing-mounted pylon pod or deployed from inside the aircraft, the towed decoy is released and extended on a cable which restrains the device and provides a source of electrical power. The purpose is to cause infrared seekers in missiles to home on to the decoy rather than the jet-pipes of the towing aircraft. Any explosion should be sufficiently distant so as not to cause damage from the explosion or from missile fragments. The decoy can be rewound or it may be jettisoned by cutting the cable if there is a failure of the rewind mechanism. An example is shown in Figure 6.24. The United Kingdom and France signed a series of contracts, covering unmanned combat aerial vehicles (UCAVs) and air-launched cruise missiles, on 15 July at the Farnborough International Airshow 2014. The primary contract progresses the joint Future Combat Air System (FCAS) programme into a new feasibility phase. The second contract commits both countries to further developing the MBDA Storm Shadow/SCALP ER air-launched cruise missile, which is in service with both nations' air forces. Both contracts were signed by French Defence Minister Jean-Yves Le Drian and former UK defence secretary Philip Hammond (now UK Foreign Secretary). They also signed a memorandum of understanding on the SCALP / Storm Shadow missile programme with MBDA that continues our co-operation on this important cruise missile capability.